Medline’s Non-Skid Shoe Covers are non-skid polypropylene shoe covers that are made from breathable, fluid-repellant spunbond material. The non-skid tread on the bottom offers good traction for jobs that require a little grip. The regular/large fits up to mens size 12, and the x-large fits up to mens size 15. 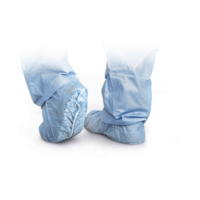 For more information on Medline’s Non-Skid Shoe Covers, please visit www.medline.com.